She shuffles towards me on the boardwalk and stops a few feet away. I am clearly in her way. As I move aside, she rushes past, ducks under the railing, and reaches for her partner. It’s a happy reunion. I am at Boulders Beach, near Capetown, South Africa, to see African penguins. These small, seemingly tuxedoed birds are at once, adorable and entertaining. They are also on the brink of extinction. Multiple factors are responsible for their dwindling numbers— habitat destruction, loss of nesting sites, marine pollution, predator attacks, and a scarcity of food owing to overfishing. In 1990, there were about five to 10 lakh pairs of African penguins; in 2000, around 50,000 pairs existed; and today, just about 18,000 live in South Africa. In 2010, these penguins were officially stamped ‘Endangered’ in the International Union for Conservation of Nature’s Red List of Endangered Species. 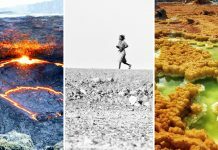 With a loss of over 95 per cent individuals, the species is now at its lowest recorded number. This is why numerous people and organisations are now fighting to save the African penguin from extinction. And this is why, on an extremely windy day, I find myself heading to Seaforth Beach, 500 metres from Boulders, in Simon’s Town, keen to learn about the lives of these beautiful birds and the conservation efforts being made to protect them. Simon’s Town was once just a small, historical place on the eastern side of Cape Peninsula, home to the South African navy and a rest stop for those on their way to Cape Point. 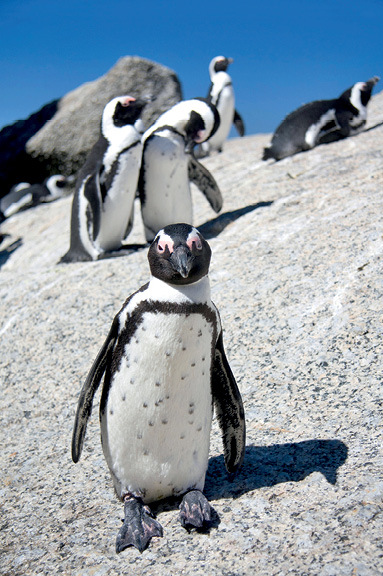 In 1983, a pair of African penguins swam up to Foxy Beach and decided to stay. 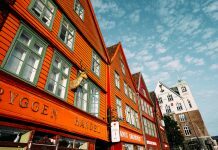 They had abundant food (anchovies and sardines) and safe nesting sites—rapid urbanisation had reduced the number of predators. It marked the beginning of a new penguin colony on the west coast. Jon Monsoon was nine when he saw this pair and wrote a story about them, which later got published. Over the years, the number of penguins grew, and so did his fascination. Monsoon became a conservation journalist, and later a certified marine conservationist and the director of Shark Warrior Adventures (a responsible tourism initiative, which is part of the non-profit organisation AfriOceans Conservation Alliance). 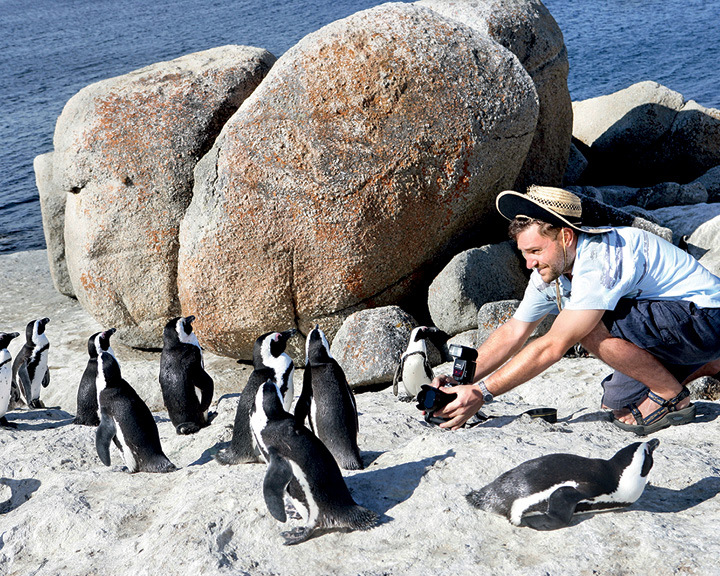 To this day, he continues to tell the story of the African penguins through walking tours of the area. Monsoon’s walk begins on a small stretch of Seaforth Beach. One end of it is cordoned off, and it’s easy to guess why: sunning themselves on the boulders are a few penguins. “There are a couple of nesting areas here,” says Monsoon, pointing to little caves in the boulders and the grassy patch of land above it. Seaforth is where people can watch the penguins for ‘free’. As a result, the birds are often chased around and back into the water, tiring them and keeping them from feeding their chicks. The fence keeps beachgoers out of penguin territory. The walks Monsoon conducts are a way for him to keep track of the birds under the care of Shark Warrior Adventures. He carries a clipboard with drawings of the penguins. Each bird has a unique collection of spots on its chest, like a fingerprint, that makes it easy to identify. If a new individual is spotted, Monsoon draws its spot pattern, the beak shape (to distinguish between the male and female), and enters it into the record books. And yes, they all have names. There’s the ‘married’ couple of Susan and David who had a baby earlier this year, and the grumpy Matt, who glowers if we go too close. As we walk, Monsoon points out a few nesting sites emphasising on those that would be easy prey for predators like seagulls and even pet dogs. “Many residents here aren’t happy with the penguins—they smell and make a lot of noise, and they brought in too many tourists. When they take their dogs for a walk, they leave them loose, and the animals immediately sniff out the eggs and destroy them. It’s a sad situation,” he says. But the locals’ mindset is slowly changing. Monsoon takes me beyond Boulders Beach, towards a private residential area. Here, residents have worked together to create a space for the penguins to live, separated from their homes by a boardwalk. 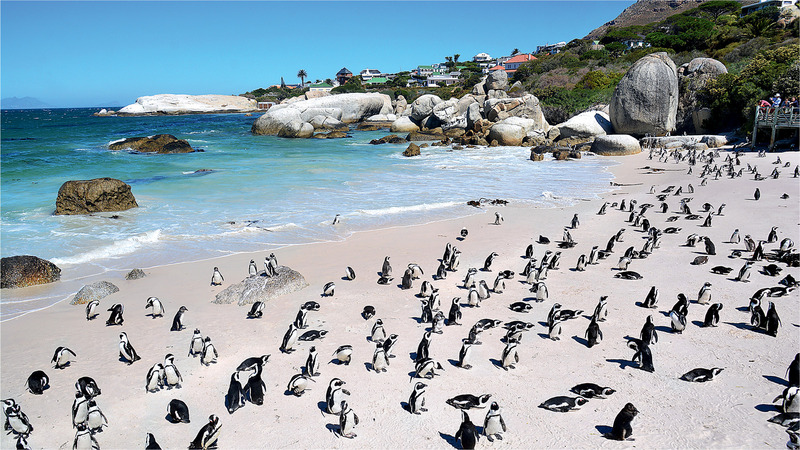 Boulders Beach is a reserve, part of the Table Mountain National Park. SANParks took over its management in 1998, bringing in changes that protected the penguins while satisfying demands of the locals. A boardwalk was built for penguin-viewing in 1999 all the way to Boulders Beach (entry here is charged), and a fence kept the penguins from wandering inland. Another boardwalk takes visitors down to Foxy Beach. This place is penguin central—a blur of black and white adults, and fluffy grey chicks. While some of the birds feed, others rest and dry themselves, and some others stand guard on the perimeter, watching out for predators. SANParks, too, keeps a watch for molting season, predators, and abandoned babies. The South African Foundation for the Conservation of Coastal Birds (SANCCOB) helps in the monitoring and rehabilitation of these birds. 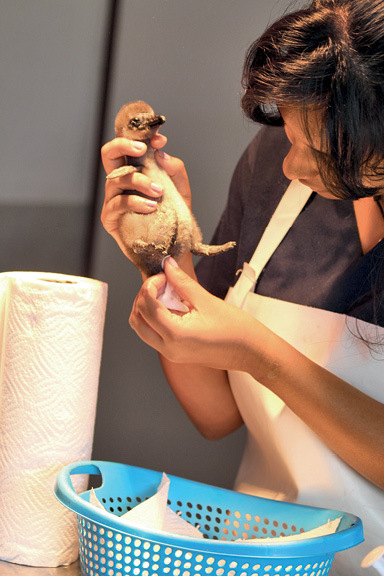 “Any oiled, injured, or diseased penguins, or eggs or chicks in nests found in vulnerable areas, are sent to us for incubating, hatching, raising, and release. Chicks that are taken in from the wild are hand-reared and released once they are ready to cope on their own (about three-four months of age). They are released at the same age and developmental stage as chicks in the wild leave their parents,” says Dr Lauren Waller, Leiden Conservation Fellow, SANCCOB. Every October, they also host the African Penguin Awareness Day, which includes a public penguin release and educational programme. Another NGO working for the cause on a large scale is BirdLife South Africa. “We address the core threats that are affecting all penguins,” says Andrew de Blocq, Coastal Seabird Conservation Project Officer. The contemporary threats to penguins include sub-optimal breeding habitats, occasional oiling, predators, climate effects, and the primary one, food scarcity. Their work involves creating new colonies for penguins and dealing with the threat of fishing. “We are trying to encourage fisheries to fish more in the southeast because that is where the main fish stock is, and this would also ease pressure on the west-coast penguins,” says Blocq. At the moment, it appears the penguins are unaware of the threat of extinction. They seem happy enough, just not the kind you would see in Happy Feet. “The movie has given children the wrong idea. They come here expecting to see them dance, and then get disappointed. There’s more to the penguins than what’s shown in the movies,” says Monsoon. lives, is more fascinating than any plot of a Hollywood movie. Connecting flights run between major Indian metros and Cape Town. Simon’s Town is 45 kilometres from the capital; take a train to Kalk Bay, followed by a 15-minute cab ride from there. One & Only Cape Town on Dock Road and Taj Cape Town near St George’s Mall are good options for a comfortable stay with magnificent views of the Table Mountain. The best time to visit is between October and March—the likelihood of rain is low, and the breeding season begins in February.